Glow where it matters most. This clever, double-sided earring treats you to strategically placed glimmer. The best part? 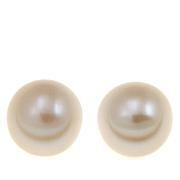 You get the classic versatility of cultured pearl studs paired to a fresh and fun, front-to-back design. The pearls are of good quality and have good lustre. 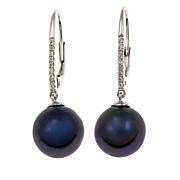 The earring posts fit snugly into the locks of the other pearl. The posts are thin and not thick. I gave them 4 stars due to the crazy reversal design. I mean, the small pearl is the one that you'd normally poke through from front to back and then fasten in the back with the big pearl.The irony is, with the bigger pearl in the back, your earlobes stick out a wee bit. Maybe that's the intention so they show pearl in the back? I thought it was rather odd. However, it is comfortable.Now, if you want the big pearl in the front, you have to try to find your pierced hole from the back of the lobe. It's a challenge! I've done it, but I definitely needed a mirror to do it in and it took a few tries.Once on, they do look lovely. If you have arthritic hands I really don't think doing these earrings backwards is going to be easy for you. The pearls were very beautiful but I had a lot of trouble getting them latched in my ears. I like the larger pearl in front, and the catch was very difficult to center. The post had to go in a specific angle or would not work. These were simply too much trouble to put in. Gave up and returned. If tne posts worked better, would have been a real winner for me.